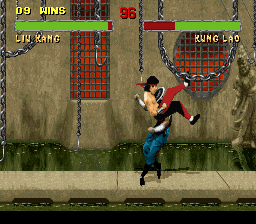 SNES Mortal Kombat II (USA v1.0) in 09:08.75 by N?K. Bruce Lee once said: "I fear not the man who has practiced ten thousand kicks once. But I fear the man who has practiced one kick ten thousand times." N?K once again pushes that idea to an absurd degree, kicking away 3.42 seconds from his previous time attack of Mortal Kombat II with better optimization. We also have a "playaround" run, which aims to demonstrate as many tricks and fatalities in the game as possible.